With the calendar turning to the month of April, Colts players will begin to trickle back into the Indiana Farm Bureau Football Center for offseason activities. The Colts will begin offseason workouts on April 17. Those will last for five weeks before OTAs commence on May 22. Sandwiched in between that will be a three-day rookie mini-camp starting on May 10. The Colts veteran mini-camp will start on June 11 and span three days. On Wednesday, June 12 the Colts will be hosting a practice at Lucas Oil Stadium from 5:30 – 8 p.m.
Another date of interest for Colts fans will be the NFL Draft beginning on Thursday, April 25 with Indianapolis holding the following picks: Round 1-24, Round 3-86, Round 4-121, Round 6-192, Round 7-230, Round 7-254 (the final pick of the 2013 NFL Draft). Dwight Freeney applied many visuals to opposing quarterbacks in his days with Indianapolis. Freeney, the club’s all-time sack leader with 107.5 produced 66 of his takedowns at home – 37.5 at the RCA Dome and 28.5 in Lucas Oil Stadium. 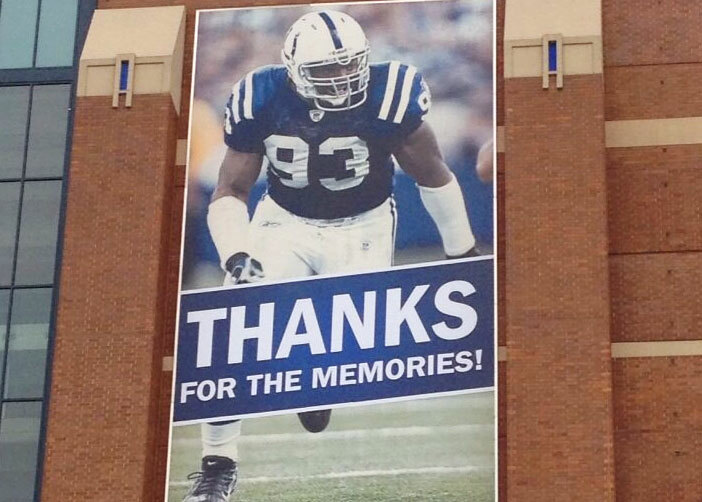 As Freeney departs Indianapolis, there is one more visual now. Freeney will become an unrestricted free agent on March 12, and will continue his career with another team. The Colts wanted to thank one of their most popular players with the message. Freeney had 25 multiple-sack games while leveling 53 different opposing quarterbacks. What’s up Colts Nation? Technology is a beautiful thing and I’ve got some pretty sweet news for all of you! As you may recall from the post-game celebration of our big win over the Lions, there was an awesome and interactive 360 degree video of the locker room. What he had been using was the Go Pano Micro, but the folks at Go Pano wanted us to get the full effect of their product. So that’s when they decided to design us a custom piece of hardware for an iPhone 5, that combined the convenience of the micro model with the quality of their plus model. Check out the pictures they sent us below, this thing is awesome! Now I invite you to watch some of the videos from this past week’s win over the Texans (especially the post-game speech) where we’re using the new mirco/plus version created exclusively for Colts Nation! Check out the videos here and go get a view of the Colts like never before. What’s up Colts Nation! So I found out some “insider information” that I had to share with you guys. Now, I know you know that Lucas Oil Stadium provides the best gameday experience in all of the NFL, and that’s something the Colts pride themselves on. Well I found out today that they have something that is going to take the in-stadium experience to a whole new level! Alright, so you know when you’re sitting at home watching a game on TV and the broadcast has the first down and ball spot markers that magically appear on the screen? Well the Colts are now adding that to their in-stadium Jumbotron so now you will be able to visually see first down and the spot of the ball. We’re one of the first teams in the NFL to offer this sort of in-game experience. I think it’ll be pretty neat and will be something that makes watching the games at Lucas Oil Stadium even better! Well that’s all I have for right now. I will be writing a tailgate blog sometime today! See you guys out there on Sunday. Be sure to visit my home page at Colts.com/ColtsFanCasey. The roof and window will be open for today’s min-camp practice at Lucas Oil Stadium. The Indianapolis Colts will host a FREE Lucas Oil Stadium Open House, Mini-Camp Practice and Select-a-Seat promotion from 11:30am to 6:00pm on Wednesday, June 13th. The fan open house portion of the day will be from 11:30am to 1:30pm and will include access to the field from 11:30am to 12:30pm. The field will be cleared for the full-squad practice at 12:30pm. Practice is scheduled to start at 2:00pm and conclude at approximately 4:15pm. Fans will also have a chance to select season tickets from approximately 3,000 available seats. All available seats will be tagged allowing fans to sit in the seat to see their view of the field before purchasing season tickets. Nearly all of the available season tickets will be in the upper level and are $690/seat. A few single seat season tickets will be available in all price levels of Lucas Oil Stadium. Select-a-Seat will run from 11:30am to 6:00pm. *Admission to this event is FREE with FREE parking in the Tire Barn South Lot.